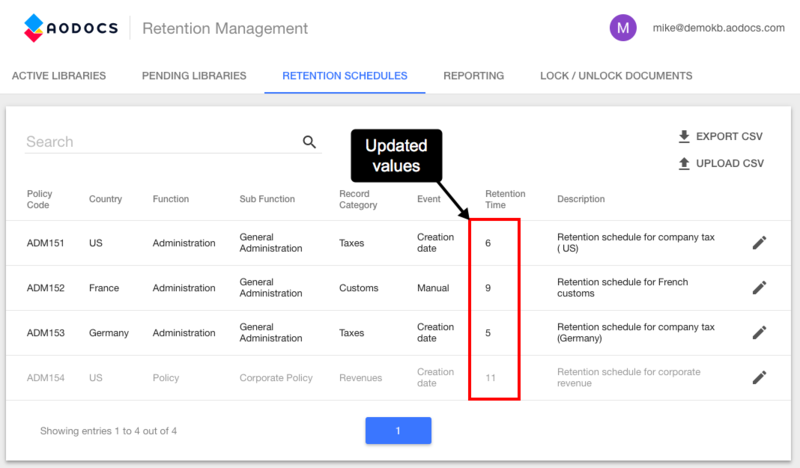 If one or more of your retention policies changes, you may want to update or deactivate the corresponding retention schedules. 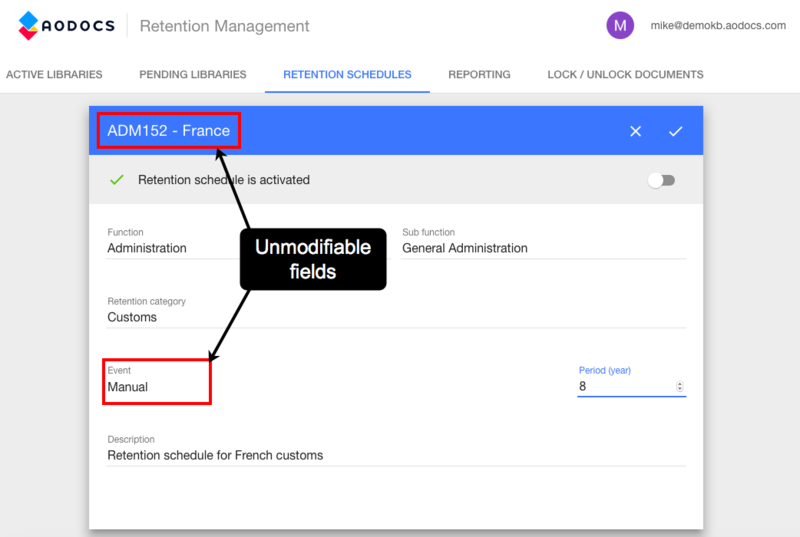 Note: You can't delete retention schedules once you have added them to the AODocs Retention Module. 1. 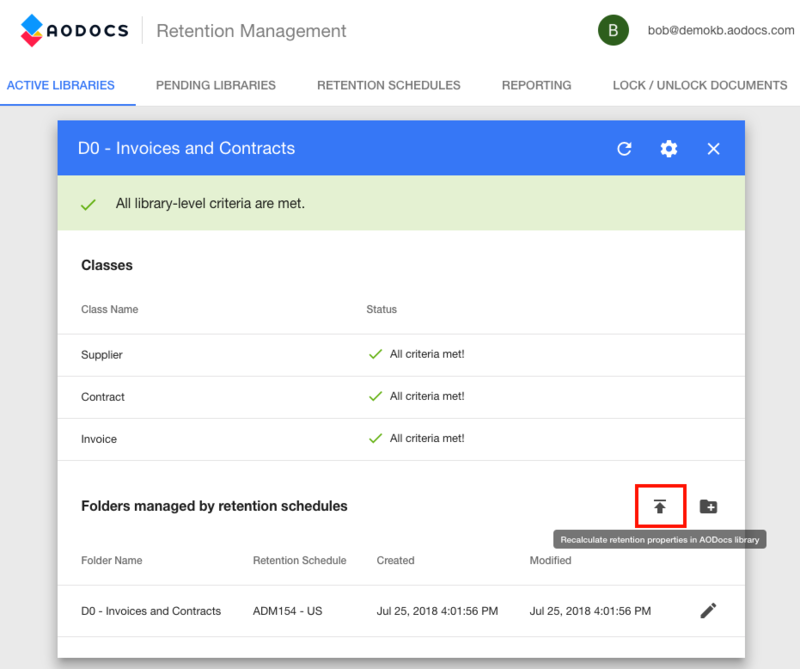 In the AODocs Retention Module, select the Retention Schedules tab. The list of retention schedules is displayed. Note: Deactivated retention schedules are grayed out. 2. You can enter text in the search bar. Note: If you modify retention schedules that are already applied to libraries, the next time the weekly Retention batch process runs, the retention properties in your documents will be updated accordingly. 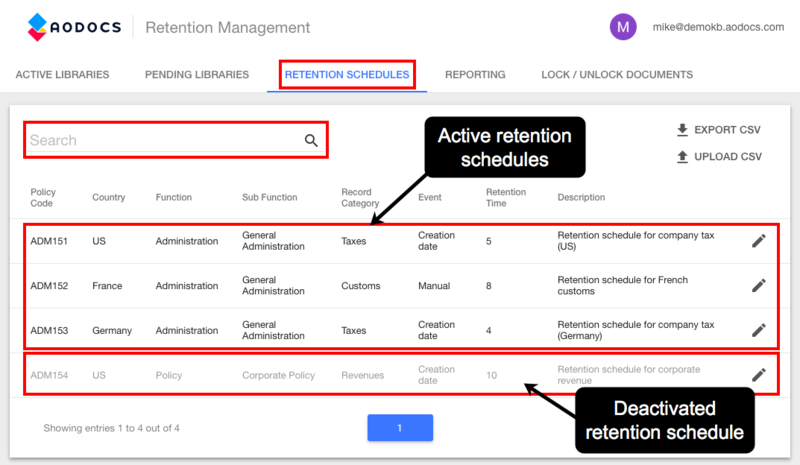 Learn more: What happens when you use retention in AODocs libraries? If required, you can force the AODocs Retention Module to run the Retention batch process. 2. Press the Edit button next to the retention schedule you want to edit. 3. Edit the required fields in the pop-up. 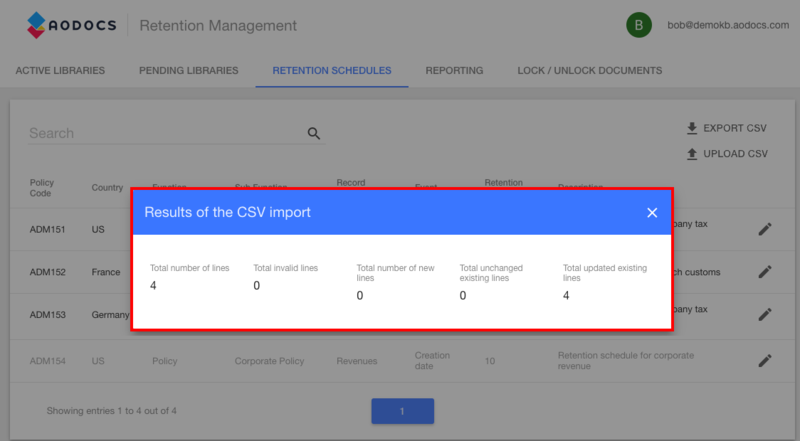 You can edit several retention schedules at once by importing a CSV file. 2. Identify the Code, Country and Event of the retention schedules you want to update. Note: You can't change the Code, Country or Event fields of existing retention schedules. 3. 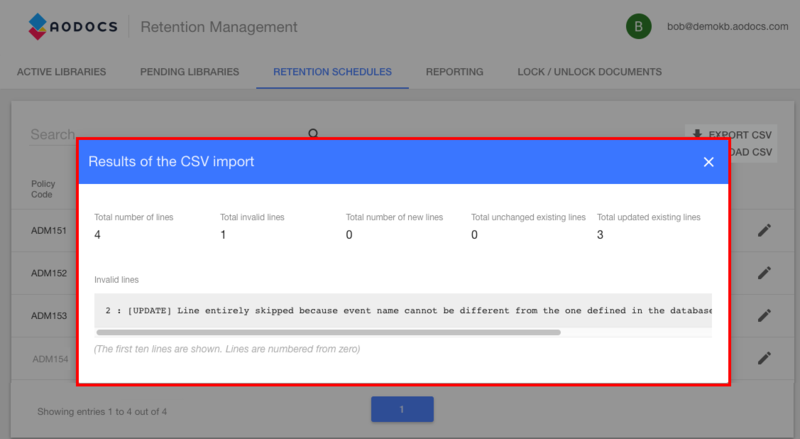 Create and configure a CSV file in the same way as when you create retention schedules, but fill in the Code, Country and Event fields with the values of existing retention schedules. 4. In your CSV file, modify the values you want to change. 6. Select your CSV file and press Open. A pop-up opens to confirm that the retention schedules were updated. 6. You can see that the schedules have been updated in the Retention schedules tab. 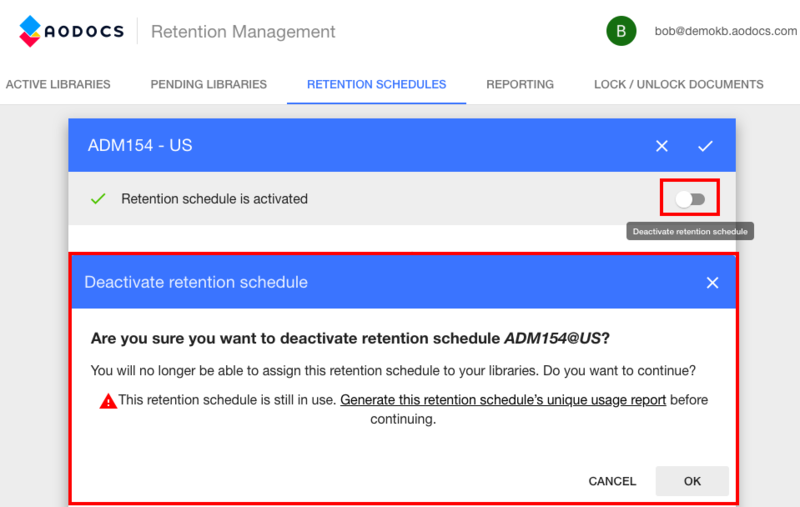 You can now assign your updated retention schedules to your libraries. If the CSV file does not comply to the required schema, the retention schedules aren't uploaded and the information pop-up displays the invalid lines. If the CSV file complies to the required schema but one of your retention schedules is missing a required field, for example, the correctly formatted retention schedules are uploaded and the the information pop-up displays the invalid lines. Note: Only AODocs super administrators and Retention super administrators can force the AODocs Retention Module to run the Retention batch process. This feature is disabled for library administrators. If you have updated retention schedules by editing them individually or by batch, you may want to force the AODocs Retention Module to run the Retention batch process to update the retention properties in the documents managed by these retention properties. 1. In the AODocs Retention Module, select the Active libraries tab. The list of retention schedules is displayed. 2. Press the Set retention schedule button next to a library that is managed by a retention schedule you updated. 3. Press Recalculate Metadata in AODocs. The Retention batch process runs and updates any properties in your documents following the changes you made to the retention schedules. You can deactivate retention schedules that you have assigned to a folder in an AODocs library. You may want to deactivate a retention schedule if a retention policy becomes obsolete and the new policy that replaces it is not retroactive. Deactivating a retention schedule prevents users from applying it to other folders. - If you deactivate a retention schedule that is assigned to a folder in a library, the retention schedule remains active in this library until all documents have been deleted. If you add new documents to the folder on which a deactivated retention schedule has been assigned, the new documents are managed by the deactivated retention schedule. - Deactivating a retention schedule doesn't delete it. 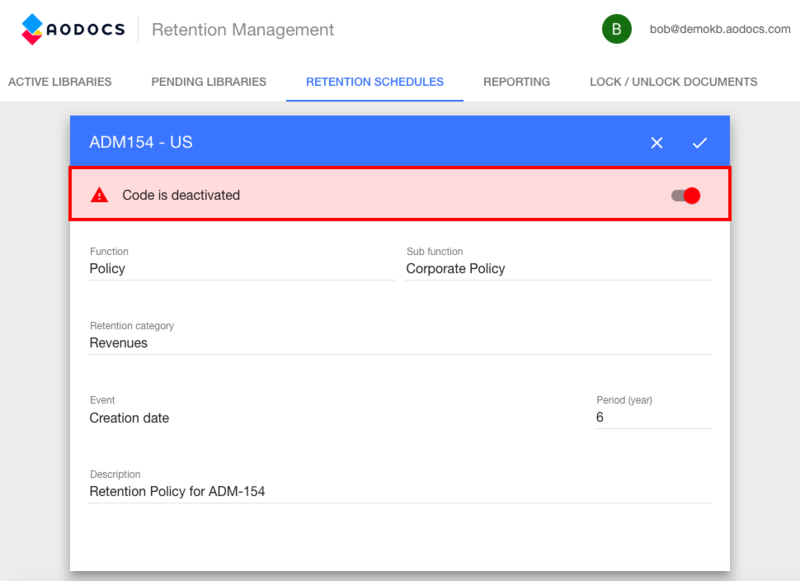 You can't delete retention codes from the AODocs Retention Module. 2. Press the Edit button next to the retention schedule you want to deactivate. 3. Use the switch to deactivate the retention schedule. 4. A pop-up requests confirmation. 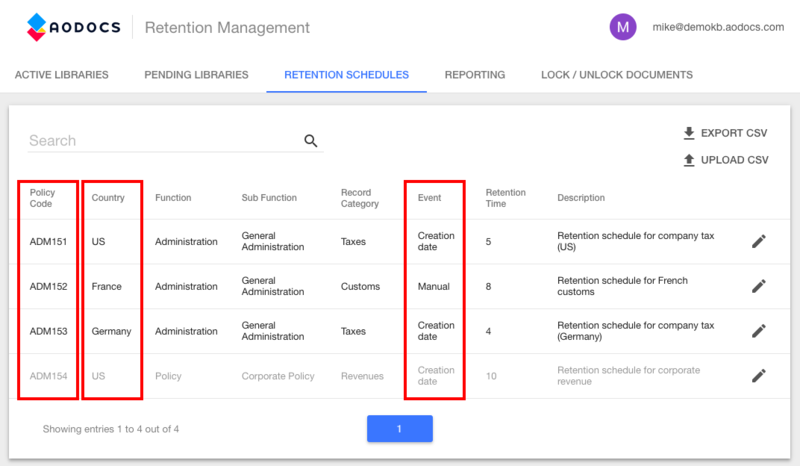 If the retention schedule is currently in use, click to generate the usage report of the retention schedule. You'll receive an email notification. If you're sure you want to delete the retention schedule, press OK to confirm. You can see that the retention schedule has been deactivated. It is now grayed out in the Retention Schedules tab.